Precision Stamping Company is one of the Midwest’s largest producers of deep-drawn stampings. Along with flat stampings and brackets, the Howell, Michigan (USA) company specializes in deep-drawn tubular products such as a spring cup that’s flared at the top and that contains stepped sections. For fast, efficient deburring, Precision Stamping Co. uses a custom Flex-Hone® tool from Brush Research Manufacturing (BRM). Unlike a standard Flex-Hone®, this custom tool has stepped sections rather than a uniform diameter. Compared to thermal deburring, flexible honing delivers better results. Jesse Parke, an engineer at Precision Stamping, wanted an alternative to thermal parts deburring, a process that removes metal burrs by burning them off. Thermal deburring can be used with internal cavities, but requires special equipment – a sealed chamber that’s filled with a mixture of oxygen and natural gas. For Precision Stamping Co., this meant outsourcing deburring operations and adding costs. By switching to flexible honing, the parts manufacturer brought deburring operations in-house. 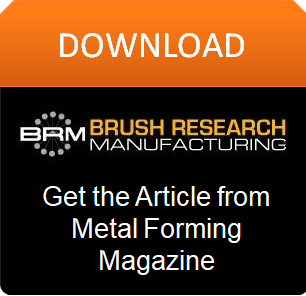 As an April 2017 article in Metal Forming magazine explains, deep-drawn tubular parts with piercings are now stamped, cleaned, pierced, and honed right on-site. A custom Flex-Hone® tool that’s mounted in an automated pneumatic drill deburrs parts quickly and gets high-quality results. 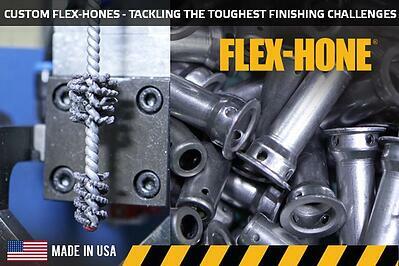 BRM offers custom Flex-Hone® tools for specialized surface finishing and deburring challenges. These Made in America metalworking tools are available in four custom shapes: cylindrical, tapered, shaped, and segmented. The shape of the tool is determined by the shape of the part that requires surface finishing and deburring. In the case of Precision Staming Co., a custom Flex-Hone® that's stepped is used for a spring cup that has stepped sections. When ordering custom Flex-Hone® tools, users specify the bore diameter along with the part length and the overall length. A variety of abrasive types and grit sizes are available to accommodate different base materials and degrees of surface improvement. To learn more about how Precision Stamping uses custom Flex-Hone® tools to save time and money, download the article from the April 2017 edition of Metal Forming magazine.